One Sunday afternoon in 2007, Morgen and I went to a local theater to see the film Into Great Silence. We expected to be pretty much the only ones there—how many people could really want to sit through a three-hour-long documentary about a group of monks in the French Alps who live in almost complete silence? Especially on a Sunday afternoon, a traditional nap time if ever there was one! But the line stretched halfway down the block, and we were lucky to get seated before the film began. The documentary contained no music except for a few scenes in which the monks were chanting, no voiceover, very limited dialog, and in fact hardly any sounds at all. I’ll admit, in fact, that we both dozed off once or twice (it pays to go with someone who can nudge you when your eyelids droop). But we also left the theater agreeing that we’d just seen one of the coolest things ever: an intimate glimpse into the lives of the Carthusian monks who live at the Grande Chartreuse monastery near Grenoble, France. That we should be drawn to the story of monks living in silence probably comes as little surprise; the themes of quiet and solitude have come up repeatedly here at Interesting Thing of the Day. 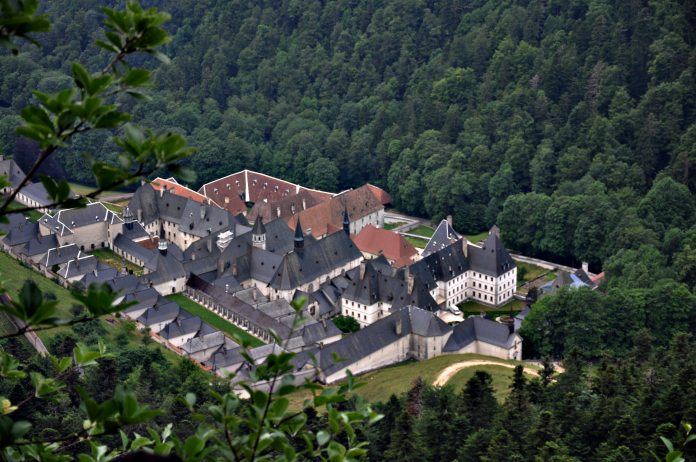 But we were frankly shocked to discover that life at the Grande Chartreuse, as depicted in the film, seemed completely at odds with our image of what has been called one of the most ascetic monastic orders in the world. The monks’ cells looked quite comfortable and reasonably spacious. The monastery’s setting in the Alps was simply breathtaking. Even the food looked amazing—no shortage of fresh produce and delicious-looking bread. We also saw a few moments of monks at play and got a small taste of their sense of humor. They seemed, to me, quite comfortable, well-adjusted, and serene—yet intensely focused on their work. I turned, as usual, to the web to get more details about the monastery and the order of which it is a part. The Carthusian order was founded in 1084 by Saint Bruno. The first monastery—at the site of what is today the Grande Chartreuse—was established in the Chartreuse Mountains in southeastern France. Over the centuries, the monastery has burned down and been rebuilt several times, its occupants have been displaced by wars, and various other catastrophes have occurred. The structure as it exists today was built in 1688, and is one of 24 such monasteries, or charterhouses, around the world; the word charterhouse and the name Carthusian both come from the same root as Chartreuse. Nineteen of the Carthusian monasteries house monks, while the remaining five house nuns; with minor differences, the day-to-day lives of the 450 or so members of the order are the same, regardless of gender. Although the monks do not take a vow of silence, they limit speaking to times when it’s strictly necessary so as to focus all their attention on contemplation. Each monk spends most of the day alone in a cell—in this case, typically a two-level apartment with space for sleeping, eating, work, and prayer, along with a garden area outside. They gather three times a day for prayer services, once a week for a shared meal followed by a recreation time, and on other special occasions. Every hour of every day is rigidly scheduled, and only about six hours per day is allowed for sleep—in two segments, separated by a long service in the middle of the night. Becoming a Carthusian monk involves a multi-stage discernment process that can last as long as eight years before taking the eternal vows; during this time, the monks-in-training can choose to leave or be asked to leave if the other monks feel they don’t fit in or have not chosen their vocation correctly. Only a small percentage of those who set out to become monks ultimately stay. The order distinguishes between fathers, who have taken the vows and who live in almost complete solitude, and brothers, who spend more of their time working to maintain the monastery, preparing the meals, and so on, rather than focusing entirely on contemplation. Of the brothers, some are full monks while others are laypeople who have a sort of volunteer arrangement with the monastery and are therefore given more leeway in the use of their time and their interactions with each other. The Grande Chartreuse is a huge complex situated on some prime real estate, and despite the simplicity of the lifestyle practiced there, the monks do require some income to pay for things like the electricity bill, building maintenance, fabric, and any food they can’t grow for themselves. One source of income is the sale of the eponymous Chartreuse liqueur. Only three monks at any time are privy to the drink’s secret recipe, which reputedly contains extracts from 130 plants. The herbs are mixed at the monastery and then sent to a distillery in the town of Voiron for processing and bottling. Other monasteries have their own sources of income so as to be self-sustaining as much as possible, and those monasteries with greater income share with the ones that have less. The monastic lifestyle depicted in Into Great Silence produced surprisingly mixed feelings for both of us. On the one hand, the silence, the solitude, and the simplicity of their lives held great appeal. On the other hand, the intense schedules, the lack of variety, and the inability to travel would probably drive us mad. Not to mention the little fact that we aren’t actually Catholic, and don’t accept many of the beliefs that are central to the monks’ daily practices. However, I’d be thrilled to see a secular version of the Grande Chartreuse: no scripture chanting, shaved heads, midnight chapel services, or eternal vows, but the same combination of solitude and community, the same silence, the same blend of contemplation and work. Sure, I’d still want periodic doses of the outside world, but even getting halfway to what the Carthusian monks have seems heavenly to me. Note: This is an updated version of an article that originally appeared on Interesting Thing of the Day on March 23, 2007.